Borough Municipal offices are located at 59 East High Street, Gettysburg PA 17325; phone: 717-334-1160. Photo: Sheads House, ca. 1862, 331 Buford Avenue, Gettysburg, PA. Listed on the National Register of Historic Places in 1976. Photographed by User:Smallbones (own work), 2010, [cc-by-1.0 (creativecommons.org/publicdomain/zero/1.0/deed.en)], via Wikimedia Commons, accessed July, 2013. The Gettysburg Battlefield Historic District was listed on the National Register of Historic Places in 1975. Supplemental material was added in 1985. It was prepared to "outline Gettysburg's significance as a county seat representative of the architectural and cultural heritage of south-central Pennsylvania." Text below was adapted from the 1985 added material. Adaptation copyright © 2009, The Gombach Group. The Gettysburg Battlefield Historic District incorporates most of the town of Gettysburg and the Civil War Battlefield area. The district has two specific areas of significance. First, Gettysburg has been the political, financial, and commercial center of Adams County since the county was established in 1800. The cultural resources within the district are representative of a broad pattern of history in this region. 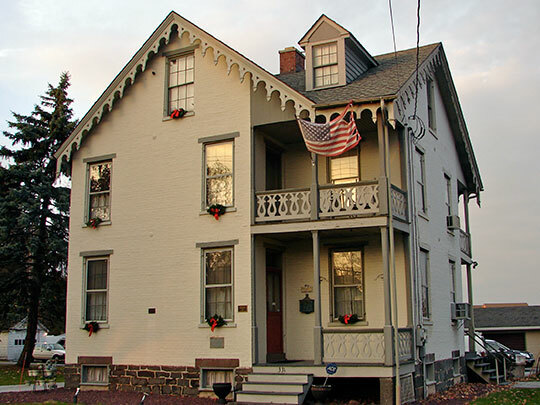 The development and evolution of Gettysburg presents regional characteristics in town planning and in architectural history including excellent examples of vernacular and formal residential, commercial, industrial, educational and ecclesiastical architecture from the late 18th century through the mid-20th century. The history of the town and its architecture reflects many regional characteristics of south-central Pennsylvania's heritage. The second area of significance is the history surrounding the events leading to and occurring during the Civil War Battle of Gettysburg. This additional information about Gettysburg's significance will cover this first area of broad cultural resources depicting an important pattern of history. Gettysburg is the county seat of Adams County, Pennsylvania and is located at the convergence of significant early transportation routes. These routes are the present-day U.S. 140, U.S. 15, and U.S. 30 which connected Gettysburg with the state capital at Harrisburg, York and other points east to Philadelphia, Chambersburg and other points west to Philadelphia, and important communities to the south in Maryland including Frederick and Baltimore. Geographically, the area is located at the foothills of the Appalachian Mountains. The topography of the region ranges from gently rolling to sharply rolling hills of fertile soil. Gettysburg is situated on a fairly level site. The original plat of Gettysburg was laid out by James Gettys in 1786. It consisted of a town layout with a central square, locally known as a "diamond," and 210 lots. The lots are laid out primarily in large parcels of 14 lots—7 on each side of a common alley. The major streets running into the diamond are Baltimore Street and York Street. Other streets identified on the original plat are North Street, West Street, East Street, and High Street. The plat, with its diamond and common alleys, presents characteristics typical of the Pennsylvania German cultural region. The residential, commercial and industrial architecture of Gettysburg is densely developed, particularly in the section around the diamond. The development and growth of Gettysburg focused on the diamond and radiated out from this commercial center, a pattern that is relatively discernible in its present townscape. The architecture exhibits a wide variety of vernacular styles ranging from small domestic frame, brick, and stone houses through Victorian and early twentieth century residential and commercial structures. Gettysburg presents a continuum of residential architecture reflecting the national changes in "high style" design with a significant cultural lag. The basic building form is an early 19th century vernacular farmhouse combining Pennsylvania German and English influences. Constructed in brick or frame, these buildings are two stories with a rectangular or L-shaped plan, gable roof, symmetrical arrangement of fenestration, and simple detailing. This basic form was updated with fashionable architectural characteristics in detailing or design through the late 19th and early 20th centuries. The expansion of Gettysburg, particularly after the arrival of the railroad in the late 19th century, allowed for these incremental additions as well as new construction in the commercial district, so that one walking the streets of Gettysburg can read the evolution and development of the town through its existing architecture. The diamond has always been the center for commercial activities in Gettysburg. The first public building was the court house which was erected in the center of the diamond, a location popular in south-central Pennsylvania communities. The residences, craft shops, and businesses were constructed in the area around the diamond and by the late 19th century, most of these structures contained commercial uses. Many of these buildings were updated or reconstructed to contemporary commercial architectural designs. The commercial buildings demand attention through their height and the detailing on the facades which follows more closely current national trends: plate-glass display windows, Romanesque arches, and ornamental detailing for upper floors. The early 19th century history of Gettysburg is marked by a developing craftsman tradition, particularly in the area of wagon and carriage makers. Industrial buildings were constructed mainly in the second tier of blocks away from the diamond. With the coming of the railroad during the late 19th century, industrial buildings were located along the railroad tracks. Most of the buildings from the earliest period have been demolished, while some structures still exist from the railroad period. These buildings architecturally were primarily functional and possessed little or no high-style architectural qualities although there are some exceptions to this rule. The Gettysburg Battlefield Historic District is in overall good condition. The majority of the buildings retain their original design and ornamental characteristics with some maintaining their original use. The residents have a strong and continuing interest in the preservation of their community. Restoration and rehabilitation has been underway for several decades, especially in the area around the diamond. There are several, but few, intrusions, although one of the significant buildings on the diamond was recently gutted by fire. Also, a significant problem is misguided restoration techniques through the use of sandblasting for cleaning exterior masonry. Overall, the community has been supporting a strong program of historic preservation through both public and private activities. Gettysburg was created like many small towns in the Pennsylvania German cultural region through the efforts of an individual land owner and entrepreneur. In the early 1780s, James Gettys established a farm on part of the land that would later be Gettysburg. Gettys apparently laid out the town in 1786 (annual ground rent cited in the original deeds for town lots is stated to begin on January 1786) and the land records show that most of the lots were sold in the period from 1787 to 1814. A greater impetus for growth began with the founding of Adams County in 1800, a movement which had been started by Gettys and other landowners in the 1790s. With the designation of Gettysburg as a county seat, public architecture has played a significant role in the community's history. The first courthouse was built at a location in the center of the diamond and in an architectural style traditional to south-central Pennsylvania towns. It was a two-story, square, brick structure that sat in the middle of the diamond. A large door opened in the center of each facade facing towards the four streets coming into the diamond. The lower floor served as the court room with the second story containing two galleries. On the east side of the south floor was a staircase on each side that lead to the galleries. Adam County was established in 1800 and the first courthouse was built by 1804. In 1859, the original structure burned down and a new courthouse was constructed at the southwest corner of Baltimore and West Middle Streets. The 1859 courthouse is listed individually on the National Register of Historic Places. During the same period as the courthouse, a second public building was constructed: the Adams County Jail. The original structure was built between 1800 and 1803 on a lot donated by James Gettys for use as the jail. It burned in 1850 and a new jail was constructed in 1851 which is located at 59 East High Street. The new jail also contained architectural characteristics of the early Victorian period. It was raised to three stories in 1889, and in 1949 was purchased from the Adams County Commissioners by the Adams County Free Library Association. It is currently in use as the Adams County Library, thus it has been in continuous use as a public structure since its construction. The early residential architecture of Gettysburg followed the regional patterns of the vernacular architectural tradition found on the farms and in small towns in south-central Pennsylvania. The primary building type was a two-story house constructed of log, frame, brick, or stone. It typically had a rectangular or L-shaped plan, gable roof, symmetrical facade and a gable-end chimney. The greatest percentage of the earliest houses were constructed of log, but as industry developed in Gettysburg, bricks were manufactured and by the late 19th century brick became the primary building material. The James Gettys House provides one example of the use of log construction in Gettysburg. Documentary resources indicate that Gettys ran a store, post office, and boarding house from his farmhouse in the 1790s. Although this structure was destroyed by fire in 1880, contemporary references and one photograph of the structure show it as a two-story log house with a double-tiered porch on the front (double-tiered porches were frequently found on early taverns in this region). Architectural records of the community show that many of the early houses were constructed of log, generally as two-story, two-room log structures. The early architecture of the community was also strongly influenced by regional Pennsylvania German architectural characteristics. A structure representative of the Pennsylvania-German architecture is the Codori House at 44 East York Street. The land records show that Michael Hoke purchased lot 7 from James Gettys in 1787. The stone house on this lot was apparently constructed before 1796, when Michael Hoke sold the property to Henry Hoke for 750. The property remained in the Hoke family until 1838, when Robert King purchased it. Five years later, he sold it to Nicholas Codori, whose family retained ownership of the house through the mid-twentieth century. Pennsylvania-German characteristics of this house include the style of stone masonry construction, two-story with a gable roof design, six-over-six windows with panelled shutters on the first story, and four-panelled door with panelled door frame. The interior has a two-room plan also with Pennsylvania German characteristics including period hardware, wood trim and large kitchen fireplace. A representative example of the regional vernacular style is 241 Baltimore Street. The land records provide evidence that this structure was built in 1817 by G. Sweeny and the newspapers contain an 1819 sale bill that describes the property. This structure has a three-bay main facade with a side entrance. It is constructed of frame which is now covered in German siding but probably was covered in weather-board at its construction. It has an interior-end brick chimney at the north gable end. The window sash and door trim has been remodeled during the Victorian period but the shape, proportion, and style of house represent the characteristics of the vernacular style. The houses in the vicinity of 241 Baltimore Street provide a microcosm of the diversity of styles and period ornamentation that reflects the history of residential architecture in Gettysburg. For example, 243-45 Baltimore Street is attached to the south gable end of 241 Baltimore Street. This attached house is a double house with a five-bay main facade. It has a double entrance and the window trim of the structure has an ornamental architrave that was popular in this region in the 1860-70s. Next door at 247 Baltimore Street is a tall three-story structure depicting the influence of Victorian design on late nineteenth century residential construction. This is a three-bay brick structure on a stone foundation with a flat roof. Victorian style ornamentation includes a panelled and bracketed oriel window above the main entrance on the second story and a wide bracket cornice at the roof line. This heterogeneous mixing of styles and ornamentation is found on most of Gettysburg's residential streets in the original town area. At 240 Baltimore Street is a tall Victorian-style structure with a brick-constructed, serpentine-arched porch recessed into the main facade, a circular tower with turret at the northwest corner of the main facade and a cross-gable on the roof. Other Victorian ornamentation include brownstone sills and lintels, and patterned slate roofing on the turret. The house is flanked by a three-bay brick structure (238 Baltimore Street) in the regional vernacular style with a later oriel window over the entrance, and a five-bay frame structure (244-46 Baltimore Street) that predates the Victorian building by approximately 50 years. As one approaches closer to Lincoln Square, it is more frequent for the structures to have been rebuilt towards the mid-to-late 19th century. The 100 block of Carlisle Street has a row of three-story brick structures that present a uniform appearance in scale, but numerous differences in ornamental treatment. The stark Federal-style appearance of the three-story structures is frequently broken up by two-story oriel windows, projecting curved bays, and different cornice treatments. It was also frequent for some of the residences in the Lincoln Square vicinity to also be used for commercial purposes or to be converted to commercial use during the 19th century. One example of the latter is the David Wills House, at 12 Lincoln Square which is the earliest surviving building on the diamond. The structure was built in 1818 by Colonel Alexander Cobean as a private residence. It was bought by the Bank of Gettysburg in 1823 and leased to Anthony B. Kurtz for Kurtz's Tavern. In 1854, it was bought by David Wills, an attorney and later an Adams County Judge, as his residence and law office. Wills was the head of the National Cemetery Commission and it was in this house that President Lincoln stayed for the dedication of the Soldier's National Cemetery. The Wills family sold the structure in 1897, and it has been used for commercial use since that time. The structure is a three-story, six-bay by six-bay building with a gable roof. The first story has been altered somewhat for commercial use, but the second story remains intact as a museum known as the "Lincoln Room Museum." As the 19th century progressed, the prevalent architectural form in Gettysburg stayed closely aligned to the regional vernacular architectural style with some minor variations in facade treatment and ornamentation. This can be seen at 20-22 East Middle Street which consists of a two-story brick double house. The basic three-bay symmetrical facade has been retained in these structures with side entrances and a side-hall plans. The lot was sold in 1824 at a Sheriff's sale with the only improvement being a large brick barn. In 1846, the property was sold to Moses McClean who built the double brick house in 1858. In conservative Gettysburg, the same basic house type, two stories, gable roof, symmetrical facade, was persisting through the mid-19th century. This house at 20-22 East Middle Street has been remodeled several times, with the addition of oriel windows on the second story of each section in the late nineteenth century, and dormer windows on the roof in the early twentieth century. During the late nineteenth century, however, the many national influences that were affecting architecture throughout this region became present in Gettysburg. Especially with the coming of the railroad, new materials, new lines of communication, and new architectural ideas were being introduced into communities across the country. Victorian styles of construction were being found throughout Gettysburg and Victorian-style ornamentation was being applied to earlier houses. One house that breaks from the regional vernacular tradition is 115 Stratton Street. This house presents elements of the Queen Anne and Stick styles with its T-shaped plan, projecting gable front, wrap-around porch, and turned porch brackets, posts, and decorative truss in the gable. Other Victorian styles were also present in Gettysburg's residential architecture. They followed the popular idioms of the Victorian architectural tradition including Second Empire, Stick, Queen Anne, and Shingle styles. There is also an excellent example of Richardsonian Romanesque style at 38 East Middle Street. This house is constructed of brick with a cut-stone main facade. While it does not have the round-arch openings which are the key feature of this style, it does have the rough-faced, squared stonework, projecting bays, cross-gables, and ornamental trim popular in this tradition. It is during this period that Gettysburg is expanding beyond its original boundaries. Much of the architecture throughout the areas being developed in the mid-to-late nineteenth century reflects a combination of the regional vernacular tradition and national Victorian influences of the late nineteenth century. Many of the streets, such as Stratton, Washington, High and Middle Streets, project this image of residential Gettysburg. The area north of the original town lots developed substantially with the growth of the Lutheran Theological Seminary and Gettysburg College. Many of the houses in the vicinity of these two institutions were large structures on sizable lots, reflecting the affluence of Gettysburg during the late 19th century. One example is 249 Carlisle Street which, although built in the late 19th century, reflects the adherence to the symmetrical facade traditionally found in this region. The structure is a three-story building with a central entrance. It is constructed of brick and has a flat roof with a broad molded cornice. There is a three-bay, one-story front porch with columns and a dentil cornice. Other additions to Gettysburg were developed more in a vernacular or folk Victorian manner. The 400 block of East Middle Street represents the middle class approach to residential housing in Gettysburg. These again are primarily detached houses but on small lots and set close to the sidewalk. The building types reflect the Victorian influence in asymmetrical facades, bay windows, and porch trim. During the early 20th century, much development occurred along the west side of Gettysburg especially along Springs Avenue. These houses also reflect popular traditions at the national level including Colonial Revival, Four-square, Craftsman, and Bungalow styles. The 100 block of Springs Avenue presents some of the popular architectural characteristics of these styles, including box-like shapes, hipped and asymmetrical roof types, a variety of dormer styles, full-length front porches and Colonial Revival style ornamentation. The evolution of commercial architecture in Gettysburg follows the same pattern as that of the residential architecture. In fact, much of the early commercial activity took place in a portion of the early residences of Gettysburg. This early business and industrial development included craft shops, stores, and taverns which would be contained in the owners' house. As the businesses prospered, separate structures of the local vernacular tradition were constructed to house the commercial functions. Beginning in the mid-19th century, especially with the influence of national styles, commercial architecture in Gettysburg took on a new look following national trends. One structure that reflects the nature and progress of commercial development in Gettysburg is the Fahnestock building. This building depicts the evolution of a Gettysburg commercial property throughout the 19th century. The original structure was built about 1810 and used both as a dwelling and as a tavern. It was a two-story structure with a gable roof built of brick in the regional vernacular tradition. In 1833, it was converted to a dwelling and store by Samuel Fahnestock. Fahnestock enlarged the original structure through the addition of an ell along Middle Street. The Fahnestock family became prominent merchants in Gettysburg and was associated with the stores in the Fahnestock building until 1881. In that year it was bought by another important Gettysburg personage, Edward McPherson. In 1892-95, McPherson remodeled and enlarged the structure to a Victorian appearance. His remodeling included the construction of a new storefront, addition of one and one-half stories in height, Victorian-style ornamentation including a two-story oriel window and tall bracket cornice, and the addition of a new warehouse on the west end of the building. The mixture of characteristics from early-to-late nineteenth century can be seen in the building today. Traces of the original building can be seen in the scars, seams and coloration of the brickwork. The brickwork of the early section on the main facade is Flemish bond, while the 1890s renovations contain common bond. This mixture of characteristics seen in the building echoes the varied aspects of the history of commercial development in Gettysburg. Lincoln Square is also an excellent place to view the evolution of commercial development in Gettysburg. The square was a prominent location for commercial development in Gettysburg and as such included the location of several hotels. The Wills House, which anchors one corner, was used as a tavern in its early years. The northeast corner of the square along Carlisle Street contained one of the first hotels in Gettysburg. James Gettys leased this lot to John Scott who constructed Scott's Tavern. Many of these taverns were wagon inns with a big yard usually paved with cobblestones for Conestoga wagons. The Scott's Tavern was later known as the Indian Queen Tavern, Franklin House, McClellen Inn, and the Hotel Gettysburg. The structure was gutted by fire in the 1980s and a new building was constructed with the retention of some of the facade features of the 19th century Hotel Gettysburg. The early history of Lincoln Square mixed both residential and commercial uses, but most, of the buildings have been converted solely to a commercial use. On the south-east corner at Baltimore Street is the Plaza Building which was constructed in 1854. Although the main floor has been remodeled in the 20th century, the scale and architectural characteristics of this structure show it to be of the regional vernacular architectural tradition. It once had a symmetrical main facade with a dentil cornice. The commercial architecture of Lincoln Square and of Gettysburg reflects the same patterns as found in the residential architecture. The early structures adhered to the local vernacular tradition. With the prominence of Victorian styles influencing the nation in the late 19th century, ornamentation was applied to the earlier buildings or parts of the commercial district were rebuilt. The more fanciful tradition of the Victorian period is found in the Masonic Temple located next to the Wills House on the southeast corner of Lincoln Square. Its cornerstone states that it was built in 1898 by S. M. Buchman. It is a three-story building marked by a Flemish gable central dormer. The design of the structure still retains the flavor of its period with a first-story storefront with patterned glass transom and molded cornice. The second story is marked by wide serpentine-arched windows and divided by smaller serpentine-arched windows marking the five-bays. The third story continues the smaller windows but has three separate windows in the wide bays above the serpentine-arched windows on the second story. There are recessed brick panels below the third story windows and an ornamental cornice with brackets, urn finials, and a keystone date stone in the Flemish gable. The northwest corner of the square presents again the mixture of styles found in the commercial architecture of the Gettysburg. The southwest corner however projects a monumental image that combines the importance of the corner site with the architecture of Beaux Arts Classicism. The building is the Adams County National Bank which was constructed in 1906. The structure is an excellent example of Beaux Arts Classicism which was popular in the nation at that time. The use of stone construction with applied ornamentation of the Classical style helped to enliven the large scale and proportion of this monumental structure. The facades are five bays by three bays with a separate corner entrance that cuts away the corner and creates its own bay. The planes of the facade advance and recede marked by a ground level with round arch openings, a main story with large architrave windows with large bracket and dentil cornices and a third story of smaller windows with applied naturalistic ornamentation. These are separated by pilasters with Corinthian capitals that support a wide entablature with a bracket cornice and a balustrade at the roof line. The primary commercial areas of Gettysburg are located along the four roads—York, Baltimore, Chambersburg, and Carlisle Streets that lead into Lincoln Square. These roads contain the same types of commercial structures, although the architecture is usually less refined. A good example is the 100 block of Baltimore Street which is anchored at its north end by the Adams County Courthouse. This row of business structures contains all brick buildings showing both the regional vernacular tradition and the influence of Victorian-style window trim and cornices. The block also contains a early 20th century American Legion structure of utilitarian design. The first blocks of York, Carlisle and Baltimore Streets contain similar mixtures of commercial design. On the north side of Chambersburg Street is an excellent example of a late 19th century Victorian commercial design at 17 Chambersburg Street. The first-story storefront has been remodeled in recent years, but the upper two stories show elaborate ornamental designs of pressed brick. The structure is two bays wide with each bay containing a three-section window with each window having a segmental arch. Separating the windows are cast-iron ornamental architrave and separating the bays are various patterns of brick ornamentation. Beads of pressed brick ornamentation exist between the second and third story and the third story and the cornice. The cornice is bracketed with paneled ornamentation in the entablature. More elaborate Victorian ornamentation can also be found occasionally on structures on other streets in Gettysburg. An example at 29-33 West Middle Street uses polychrome brick to enliven its facade. Alterations in the brick work on the first story show that the window and door positions have been altered in the 20th century. However the main ornamental characteristics of this structure are retained in its yellow brick segmental arches over the doors and windows on both stories, the corbelled bracket cornices of yellow bricks and the serpentine arched dormers on the half story. The 20th century architecture of Gettysburg has several other notable landmarks along with the Adams County National Bank. One is the Gettysburg Post Office constructed in 1911-1914. It is located on the northeast corner of Baltimore and High Streets and uses the Classical Revival style for its construction. It is a design by James Knox Taylor, Supervising Architect of the U.S. Treasury Department. The Post Office is a two-story structure constructed of cut-stone with a flat roof. It has a seven-bay main facade with a central entrance. The seven bays are recessed in the center of the main facade with six monumental columns that are fluted with acanthus leaf capitals marking the recess. The structure has a dentil cornice with parapet which has the inscription "United States of America" with a bas-relief wreath at each side. The sides of the structure have three recessed bays marked by pilasters with the same capital design. The door frame on the main facade has an egg-and-dart molding, scroll brackets supporting a projecting lintel and a central medallion design with floral carving. The interior design is retained with its marble floors that continued along the walls to the height of the counters and window sills, applied pilasters, and Greek-key pattern ceiling border. Another imposing 20th century structure is located on the southwest corner of Chambersburg and Washington Streets. This is the Eberhart Garage built in 1916 and it shows the transition of architectural styles from Beaux Arts Classicism to modem styles of the early 20th century. The building was constructed as an opera house but the financing failed and the Eberhart family converted it to an automobile showroom. The structure has three-story recessed bays with arched openings on each facade. The main facade marks the entrance with a fully recessed three-story bay and a large arched entablature at the cornice level. The other bays are separated by pilasters and contain a single bracket with swags at the top. There is a bracket dentil cornice and parapet. Other early 20th century buildings are more utilitarian in design. An example is the automobile garage at 100-104 York Street which is the conversion of an early building that has been remodeled with white pressed brick. This structure has a three-bay main facade with recessed windows. The southwest corner of the structure was open to allow automobiles to pass through. This structure has a bracket cornice made out of corbelled brick work. The architectural evolution of other building types, such as industrial, education and ecclesiastical structures, follows the same pattern as the residential and commercial architecture. Until the mid-19th century, this architecture is characterized by the regional vernacular tradition. National themes in architecture become increasingly influential during the late 19th and early 20th century. While many of the early industrial buildings have been destroyed, some elements of this pattern of architectural evolution can be seen in remaining railroad structures, manufacturing plants and utility buildings. Most of the early church buildings are also gone, due to the enlargement and rebuilding of churches that occurred during the late 19th century with the result that many of the existing structures are Gothic Revival. One example of an early church of a regional vernacular design is at 51 East Middle Street where the building serves a Post No. 9 of the G.A.R. Educational buildings have certainly played a significant role in Gettysburg's architectural heritage. These buildings cover a wide range of types for private academics and public schools to facilities for Gettysburg College and the Lutheran Theological Seminary. Again the architectural styles follow the pattern established by the residential and commercial architecture. An example of the vernacular tradition in educational architecture is the Reuning House built as the Academy Building at 66 West High Street. It was built in 1813-15 for the Gettysburg Academy, but its architecture displays characteristics of the vernacular residential style. It is a two-story structure with a gable roof. It has a symmetrical facade with two entrances. The structure has contributed significantly to educational history in Gettysburg. The Gettysburg Academy was not financially successful, but in 1826 the Lutheran Theological Seminary began operations here. When the building was sold at a Sheriff's sale in 1829, it was purchased by the Seminary founder. In 1832, the Seminary moved into its own building and Gettysburg College was started in the Reuning House in the same year. In 1837, the Gettysburg College moved into its own building and the Academy was used as a school for young women until the Civil War. It has been a private residence since that time. Pennsylvania Hall, or Old Dorm, at Gettysburg College is built in the Greek Revival style and depicts the early stage of national architectural influences on Gettysburg architecture. The old Meade High School at Buford and Springs Avenues shows the Victorian periods influences on educational buildings in Gettysburg. Gettysburg was founded by James Gettys along major turnpike roads in south- central Pennsylvania. The original deeds for town lots provide for an annual ground rent to be paid with the earliest date being 1786, which is probably the year that Gettys laid out Gettysburg. James Gettys had moved into this area in the 1780s and patented a 116 acre tract of land known as Maske Manor. The original plat contained 230 lots and a majority of the lots were granted to leaseholders from 1787 to 1814. The plat itself is reflective of the cultural heritage of south-central Pennsylvania. The town plan is laid out with a central square known locally as "The Diamond." This plan type provided for a large square that cuts into the corner of the lots fronting on the square. In Gettysburg, as in other county seats, the square became the site for the county courthouse. However, this town plan is often used in smaller towns in the region and the town square was a site for markets, monuments, and park spaces. Gettysburg also contains another characteristic element of town planning in this region which is the use of small alleys located within the major blocks. The early architecture of Gettysburg consisted primarily of log houses. Getty's own house was constructed of log and is believed to have been built before 1783. Late-19th century photographs of the house show that it was a broad structure with an exterior-end masonry chimney stack. It had a double-tiered porch on the main facade and was covered in weatherboard. Local history States that Getty took in boarders at his house and the double-tiered porch was frequently a characteristic of taverns in this region. He also ran a store out of his house and was sheriff. Throughout the 19th century, Gettysburg was a leader in industrial development of this area. From 1800 to 1850, it was a national leader in the construction of carriages. Its location along two major turnpikes provided for a substantial market in carriage manufacturing and related industries. A number of carriage shops became well known in the region including chose owned by David Little, William Hoffman, Leonard Strough, William Graham, and Danner and Ziegler. The carriage plant would include several different shops each providing a particular element of the carriage-making process. This included a blacksmith shop for iron work and tires, a cabinet-making shop for construction of the carriage bodies, a trimming shop which provided canvas covers and other trim, a paint shop for painting the carriages and a silversmith shop for plating silver and other exterior metals. A typical early scene in Gettysburg would be a train of carriages hitched together, pulled by horse when a shop finished several, and sent them out of the city to customers. The Civil War primarily broke up the carriage business in Gettysburg, although there was a major shop remaining as late as 1906. The location of Gettysburg along major transportation routes also provided for its development as a center for taverns and inns. Early structures were generally wagon inns, which contained a big yard, frequently paved in cobblestone. This yard was for the Conestoga Wagons which were the primary source for large transportation. The Conestoga Wagons were pulled by six horses with bells and driven by a teamster either in the saddle horse or walking. The inns also provided a stop-over for stage coaches along the transportation lines. The northeast corner of the diamond was the location of a prominent hotel site. The structures at this location have been known as Scott's Tavern, Indian Queen Tavern, Franklin House, McClellan House, and the Hotel Gettysburg. The site was used for a hotel from the first decade of the 1800s until the Hotel Gettysburg discontinued in 1964. Another important hotel was the Eagle Hotel located at the northeast of Chambersburg and North Washington Streets. The original Eagle Hotel burned in December 1894 but was reconstructed and operated under other names including the Adams House. In a 1958 Gettysburg Times newspaper article. George F. Eberhart reminisced about the heyday of hotels in Gettysburg at the turn-of-the-century. Tourism to the battlefield monuments in Gettysburg made the community an important travel and tourism center. He identifies other hotels of the late 19th century including the Keystone Hotel, the James Gettys Hotel, and the City Hotel. The architectural character of Gettysburg is defined by the evolution of the early vernacular structures in the early 19th century to buildings representative of the national architectural influences in the United States during the late 19th and early 20th century. The vernacular tradition in Gettysburg consists of a mixture of wood frame, brick, and stone construction all possessing basically similar characteristics — two and one half stories; three to six bays wide; gable-end chimneys; floor plans of hall and parlor or central hall arrangement; and symmetrical placement of openings in the facade. With the growth of Gettysburg during the mid-19th century there were some changes in the street scape due mainly to the construction of new and larger domestic houses. Generally house construction consisted of the same basic house design, including the symmetrical organization of the main facades. Changes during this period could include the addition of a third story, more frequent use of a central doorway, and more extensive use of ornamentation utilizing a variety of wood and brick patterns. During the early to mid-19th century, commercial and industrial buildings frequently used the same materials and designs as residential structures. The major influence on Gettysburg's history during the mid-19th century was the establishment of the railroad. The railroad was introduced to Gettysburg with the formation of the Hanover and Gettysburg Railroad Company in 1858. This line provided only limited routes, and Gettysburg suffered in the rail competition when it was bypassed by the Pennsylvania Railroad Company. However, in 1884 Gettysburg became a full service community for rail transportation with the purchase and upgrading of the Hanover and Gettysburg line by the Western Maryland Railroad Company and with the creation of the Harrisburg and Gettysburg Railroad that connected with the Pennsylvania Railroad. The influence of the railroad on the cultural patterns and resources of Gettysburg was significant. It not only increased the business and economic base of the community, but it also provided new lines of communication and brought new materials that affected the cultural and social mores and everyday life of the population. It was a dominant factor in the increasing prosperity of the town through the latter part of the 19th century, attracting new business establishments and contributing to the tourism business that had developed around the community's significance as a Civil War site. The Victorian influences on the architecture of the late 19th century coalesced mainly in ornamentation and architectural detail. Vernacular elements were retained in some structures but many displayed typically Victorian features such as asymmetrical facades, bay windows, and large gable dormers. Mansard roofs were added to older buildings and used on new structures. Examples of trim include colored glass windows, lattice and wood-turned members on porches, and ornamental uses of shingles, pressed brick, terra cotta and cast iron. The influence of national trends in commercial and domestic architecture can also clearly be seen in the buildings of Gettysburg. Prominent businesses used the Classical Revival style such as the imposing structures owned by the Adams County National Bank and the U.S. Postal Service. Storefronts as well as domestic buildings display the new materials and design influences of the early 20th century in the use of carre glass, plate glass windows, ornamental concrete block, and various modern metals. The visual environment of Gettysburg today provides tremendous resources for its citizens and for the historian. Its street scape provides excellent architectural examples from its earliest settlement through the mid-20th century. Its historical prominence as a Civil War site is enhanced by the many themes of local history interwoven in its cultural fabric. Its growth from agrarian county seat to an industrialized business center, from a vernacular architectural tradition to buildings displaying the diversity of national influences, and the changes found in the evolution of the everyday life of its people up to modern society are all representative of broad national patterns significant to Pennsylvania's cultural heritage.